Trihouse Consulting. Learn how to loan money to the masses profitably. 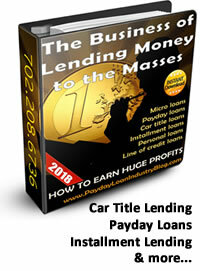 Car title loan lending, payday loan lending, installment loan lending, line-of-credit loan lending... our Course thoroughly covers ALL these consumer loan products. Trihouse Consulting offers intellectual property in the form of Manuals, Courses, Reports and Guides. We offer one-on-one advice and counsel for start-ups and experienced "players." We run 2-day intensive "Boot Camps" in one of our "live" stores. Additionally, Trihouse Consulting is a conduit to capital for experienced car title, payday loan, and other consumer loan management Teams. Brainstorm: do you have an idea? Let's explore... 15 Minute free Phone Consultation! We have been in the consumer loan, payday loan and car title loan space more than 20 years. We are store operators, Internet lenders and consultants. Virtually everyone in the business of funding consumer loans niche knows our CEO, Jer at Trihouse. Search the Wall Street Journal,, Bloomberg, New York Times... and you'll soon be made aware of his thoughts on "The Business of Lending to the Masses." How to start a Consumer Loan Business Bible. Includes your State/Province Legislation & Lic. info. Includes your State/Province Legislation & Lic. info. NOTE: Includes immeditae emailed digital version of our Payday Loan/Installment Loan Manual: The Business of Lending Money to the Masses.